CAMPBELL, CA--(Marketwired - March 26, 2015) - Technology market research firm Infonetics Research, now part of IHS Inc. (NYSE: IHS), today released excerpts from its fourth quarter 2014 (4Q14) and year-end Enterprise Session Border Controllers market share, size and forecasts report, which tracks enterprise session border controller (eSBC) session shipments and vendor revenue. 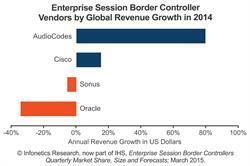 "Enterprise session border controllers are increasingly being packaged as part of a larger sale of unified communications (UC) and contact center solutions in conjunction with SIP trunking. In 2014, worldwide eSBC revenue rose to $271 million, a 6 percent gain over 2013," said Diane Myers, principal analyst for VoIP, UC, and IMS at Infonetics Research, now part of IHS. Infonetics' quarterly enterprise SBC report provides worldwide and regional market size, market share, forecasts through 2019, analysis and trends for enterprise SBC revenue and sessions by system and business size in North America, EMEA, Asia Pacific and CALA. Companies tracked: Adtran, Alcatel-Lucent, AudioCodes, Avaya, Cisco, Dialogic, Edgewater, Ingate, InnoMedia, Media5, OneAccess, Oracle, Sangoma, Sonus, Unify, others. To purchase the report, contact Infonetics: www.infonetics.com/contact.asp. Infonetics Research / IHS Inc.